If you need a retro Robot fix, head down to Hove Museum and Art Gallery this month… Not only is the collection fantastic, but check out the fabulous Robot Passe Tete’s, painted by local Artist and Mural painter Heidi Compton. Surely every kid’s dream take home? Love it. Check out more of Heidi’s work here! 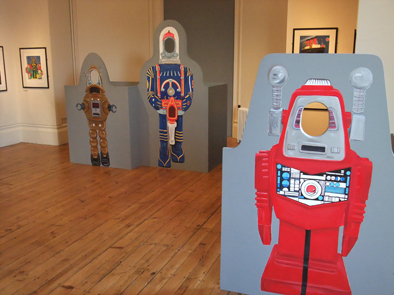 Science fiction comes to life at Hove Museum & Art Gallery in this intergalactic exhibition of robots and space toys. Robots, rockets and ray guns of all shapes and sizes including many rare vintage and collectable items invade the museum in this space-age show of robot force! 15 October 2011 to 21 February 2012. Admission is FREE.